My fifteen loyal readers might expect I would write something high-flown and inspirational for my 100th post on this blog. Nah. You'll like this better. I've been shoe shopping. Looking for a minimalist road shoe to start switching out on my shorter runs, with a goal of moving into minimalist shoes entirely by summer. 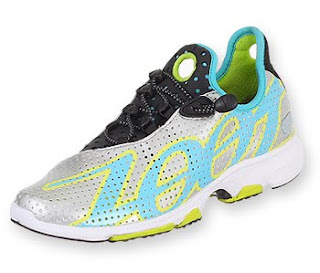 Do you have any idea what hideous, misbegotten, corneal-blistering, avert-your-eyes-Mildred running shoes are out there for sale? Brace yourselves. I first spotted the raspberry-navy-periwinkle-lemon model, but it was edged out by the demented combination of mustard suede with purple soles. Close call. But that was before I saw the red-lime-rottedgrape combo. Next, say hello to the well-ventilated, European loafer stylings of the Zoot Ultra Race. A few manufacturers out there seem to think their shoe will be the exception where industrial gray will pair well with easter-egg colors. Also, I'm not sure what those big quilted holes in the heel and tongue are for, unless the shoe doubles as a luggage tag. 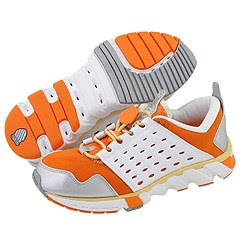 I read good things about the Inov-8 shoes for minimalist runners. 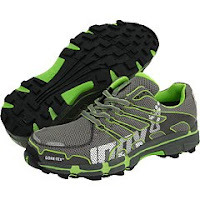 Here's the Inov-8 Roclite 275 GTX. Which is a very elaborate name for a shoe. It uses both numbers AND letters, which makes the shoe sound very scientific and with German Engineering. I imagine myself putting this shoe on and every time whispering to myself: "I am the Batman!" OK, I own a pair of Adidas Supernova Riots. 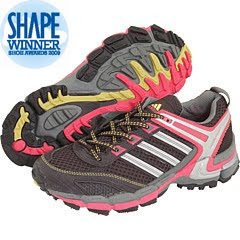 After running in minimal trail shoes, they are like trying to run in hollowed-out logs. Mine however are a tasteful palette of browns and I'll look great mowing the lawn in them. Clashing colors amuse me, but you know what doesn't? Manufacturers who think all they need to do is bolt some bad pink onto a shoe to make it women's fashion. "Ideal for world-class triathletes and runners who want world-class performance and comfort." And lest you think The Beast has gotten off lightly... Nike was off the grotesquerie scale. I am going to have to do a whole separate post in their honor.